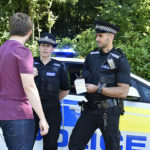 Buckinghamshire New University has been selected by Thames Valley Police to deliver degree apprenticeships in policing. In response to the Government’s commitment to improve workplace training through apprenticeships, the College of Policing along with the police service developed the Policing Education Qualifications Framework (PEQF), resulting in new initial entry routes for police constables. Buckinghamshire New University will now work with Thames Valley Police to deliver the two new entry routes for the force, namely the Police Constable Degree Apprenticeship (PCDA) – a three-year programme for candidates who don’t already have a degree-level qualification and the Degree Holder Entry Programme (DHEP). This is a two-year programme for those who already possess a degree that’s not in the subject of professional policing. Student officers will have ‘blended’ learning which will include classroom-based face-to-face teaching, distance learning and virtual classroom experience combined with operational front line duties. Buckinghamshire New University and Thames Valley Police are working together to develop the full programme of learning and assessment. Eligibility requirements and salary details are also in development. All of this activity is part of a wider South East-based initiative, with Surrey, Sussex, Hampshire and Thames Valley Police all wishing to develop their workforce in line with the Association of Police and Crime Commissioners and National Police Chiefs Council’s ‘Policing Vision 2025’. The latter states: ‘By 2025, policing will be a profession with a more representative workforce that will align the right skills, powers and experience to meet challenging requirements’. A standardised national framework allows for consistent assessment and accreditation across police forces, ensuring that the professionalism of officers is formally recognised.